I was commission to make a quilt for a baby. The requirements were … Train quilt and colors of green, blue and purple. the baby’s room walls are a light gray. I’ve always wanted to do a train quilt but my older boy is beyond the train stage in his life though he does want to be a train engineer or a farmer. I was quite excited about this project and off to my Eq program to design a keepsake for this new bundle of life. 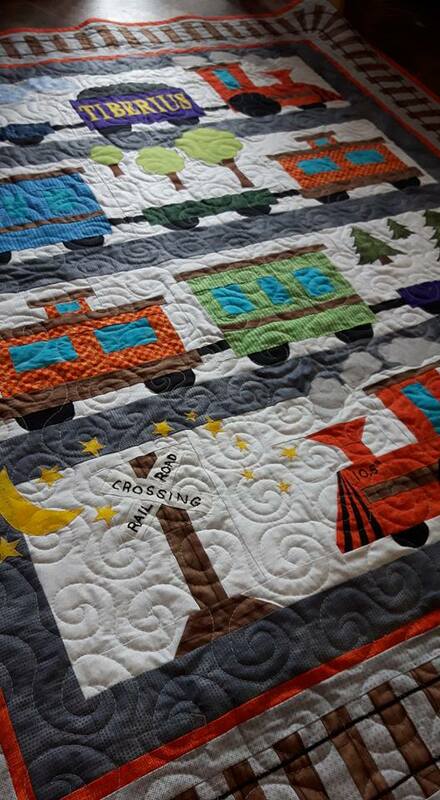 This is the EQ version of this train quilt. I was able to find most of my materials from ‘Sew Right”the quilt shop in Whitecourt AB, But the panel for the back to give this quilt a duel purpose was purchased at “Material Matters” in Drayton Valley AB.. Of course I could not go to one shop in Drayton without hitting both as they are across the street from each other. So I grabbed some materials from “Stitches & Dreams” These shops are well worth the trip. Im going to show you the steps as I made this quilt to completion. Train Engines… Took me 3 hours, I paper peiced the grill. Today (Satruday) I put in a long day I stated at 8am and did not quilt till I had the border mostly done finished out the day at 445am 20hours and 45 minutes, Im not addicted at all. lol I worked hard on this today so that i could get it finished by next friday as i have a fishing quilt that needs to be finished by the 1st of july and I need to get this one finished 1st. Rail Road crossing sign… , I had problems lining up the crossing sign. once i was happy then i drew on the words and sattin stiched over the writting. The next step was to put the lettering on the coal cars for the childs name and his birthday. We(Grandparents) choose yellow appliqued to do the name and the date. Each engine were numbered with the babys weight and length at birth. Yes it seems small but the baby was a premee. This is how the train looks like at this poing with all parts put together. Sashings and appliqued nature features… I found that the bottom left corner was too plain by the sign so we decided to add in starts and moon to fill the space up. If you really look some of the stars are placed to immitate the big dipper constalation. Train tracks… these are peiced exept for the corners where I paper peiced them. The rails are made with black yarn that I couched on. Top Done. Backing…. This took me 1hour and 45minutes to complete. Quilting and Binding took me 4 hours and 45 minutes. I just love the way it turned out. Now if I add up all my time to make this quilt I was able to conplete it from start to finish in 35 hours. And that does not take into account the cost of the materials. Then people wonder why quilters charge so much to have a quilt made for them. thank you for the words of encouragement the grandmother was glad to hear from you it sends hope.